 Source:OST from HCERES, special tabulations of Thomson Reuters citation indexes. The information from the bibliographic database used was compiled using the Thomson Reuters Web of Science service. French publications are those where at least one of the authors is based at a laboratory located in France. If an article is produced by a single laboratory (for example, one in France), then one point is awarded to France. However, if the article is co-authored by two laboratories in two different countries, then half a point is awarded to each country. This type of fractional calculation measures a country's contribution to worldwide production. To increase the reliability of the indicators, they are calculated as a smoothed annual average over three years (the value given for 2013 is therefore the average value for 2011, 2012 and 2013). A country's share of worldwide publications is the ratio between the number of publications produced by a country in a given year and the number of publications produced worldwide in the same year (as listed in the database). The share of (immediate) citations after 2 years is calculated over two years, including the year of publication. A country's observed (immediate) impact index after 2 years is the ratio between its share of worldwide citations after 2 years and its share of worldwide publications. A country's expected (immediate) impact index after 2 years is the impact index that the country would have if its publications were cited as much as the publication in the journals in which it publishes (taking into account the reputation of those journals). A country's specialisation index is the ratio between its share of worldwide publications in a specific subject area and its share of worldwide publications in all subject areas. In 2013, France accounted for 3.5% of worldwide scientific publications in all subject areas combined. Although French research shows a marked specialisation in the broad subject area of Mathematics and that of 'Astronomy and Astrophysics', its publications are most cited at international level in the subject areas of 'Agriculture and Plant Biology', 'Civil and Mining Engineering' and 'Agri-Food'. In 2013, France accounted for 3.5% of scientific publications produced worldwide in all subject areas combined and its world share of immediate citations (after two years) was 3.9%. At 1.12, its immediate impact index (ratio of its share of citations to its share of publications) is higher than the worldwide average which is 1 by definition (chart 46.01). In the early 1990s, the share of worldwide publications produced by France increased to more than 5% in 1995, after which it remained stable. From 1999, this share fell continuously, due in large part to the arrival of new countries on the international scientific scene. This marked decline from 1999 to 2005 slowed between 2005 and 2010, but has become more noticeable since 2010, when it resumed the trend observed in the early 2000s. Its world share of citations after 2 years also fell during this period, albeit to a lesser extent. As a result, France's impact index has improved significantly over the period as a whole, increasing from 0.91 in 1993 to 1.12 in 2013. France's disciplinary profile has changed little between 2008 and 2013. It appears balanced, with the exception of a marked specialisation in Mathematics (where it has a specialisation index of 1.61) and despecialisation in Social Sciences (where it has an index of 0.57). Its specialisation indices are greater than 1 in Physics and Astro-sciences and Earth Sciences and lower than 1 in Biology and Applied Ecology, Chemistry and Humanities (chart 46.02). Between 2008 and 2013, France increased its specialisation index in Social Sciences (+18%) and Astro-Sciences and Earth Sciences (+8%). By contrast, its specialisation factors in Chemistry and Engineering Science fell by 6% or more. In 2013, with the exception of Social Sciences and Humanities and Mathematics, the visibility of French publications (observed impact index) and that of the scientific journals in which they were published (expected impact index) were higher than the worldwide average in all subject areas (diagram 46.03). The average visibility of French publications was highest in the fields of Biology and Applied Ecology and, to a lesser degree, Chemistry, Physics and Engineering Science. It was also in these broad subject areas, together with Astro-Sciences and Earth Sciences, that French publications appeared in journals with higher international visibility. 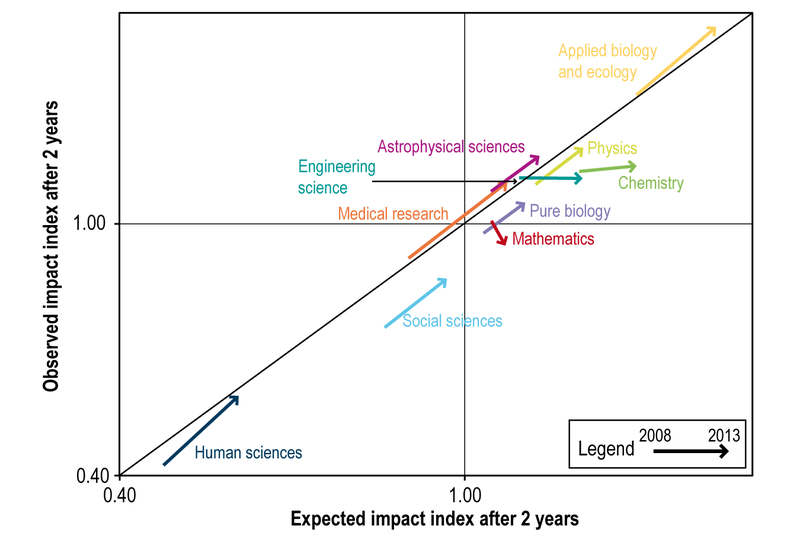 Between 2008 and 2013, France's observed impact index and expected impact index increased for all major subject areas, with the exception of Mathematics. The visibility of French publications and that of the journals in which they were published increased most in the fields of Medical Research, Biology and Applied Ecology and Social Sciences and Humanities. In 2013, France accounted for more than 5% of worldwide publications in Mathematics and the subject area 'Astronomy and Astrophysics' (table 46.04a). Between 2008 and 2013, France's share of worldwide publications declined in most of its top ten publication subject areas in Life and Materials Sciences. In 2013, France's impact index was greater than 1.25 in five subject areas (table 46.04b). Between 2008 and 2013, the visibility of French publications increased overall in the ten subject areas in which it is most visible and, in particular, by more than 15% in 'Civil and Mining Engineering' and 'Agri-Food'. France had a strong presence and its publications were most visible in 'Geosciences', 'General Physics' and 'Particle and Nuclear Physics'. Extract from the chapter "46. France's scientific publications". In 2008, the visibility of French publications (observed impact index, Y-axis) in the field of astrophysical sciences was greater than the average visibility of papers published in the same journals (expected impact index, X-axis), both of which were close to the worldwide average of 1. Between 2007 and 2012, the visibility of publications in the field of astrophysical sciences and that of the journals in which they were published increased and significantly exceeded the worldwide average for this subject area.